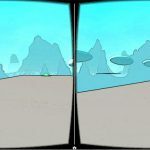 First impressions on first-time VR experience | Imagin&Tonic - VR, AR and game development. The text below was originally written by Sonia Villanueva @sonianoneka, UX senior, strategist and casual collaborator at Imagin&Tonic. 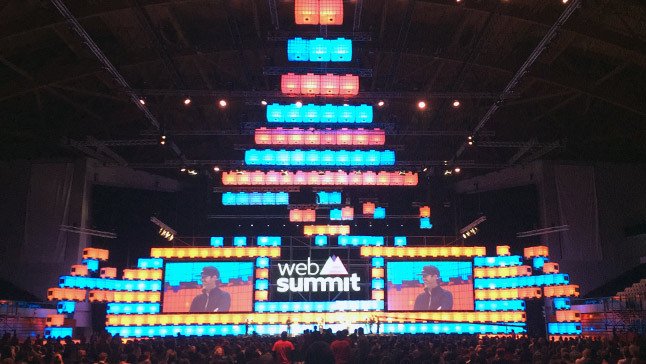 We’re glad and proud to share it with in our blog as part of our ux related serie about VR. A week ago, during a family and friends night summer, under the fully starred sky in a little village in the east of the spanish region of Salamanca, I had the opportunity to test myself -and to observe how people around tested-, three different Google Cardboard glasses. 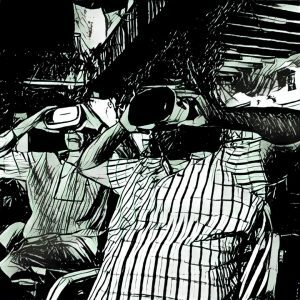 Three generations, aged between 14 and 75, male and females, hard computer users and non users at all, urban people and small village habitants; at the end: the first VR experience for most of us. Based on that, and on some casual conversations with the team of Imagin&Tonic, I made some observations and notes on the user experience field. Three generations, aged between 14 and 75, having their very first VR experience. As more immersive is the experience, bigger is the need of control. VR is a new environment, not only involving usability or ergonomic considerations: here we have to talk about physiological perceptions involving sense of balance and ubiety, and the experience can cause sickness and a feeling of misplacement. Dizziness not always happen, but, when people were thinking aloud, I often heard “I don’t know where I am” or “How can I go back?” or even “I don’t know where to go”. 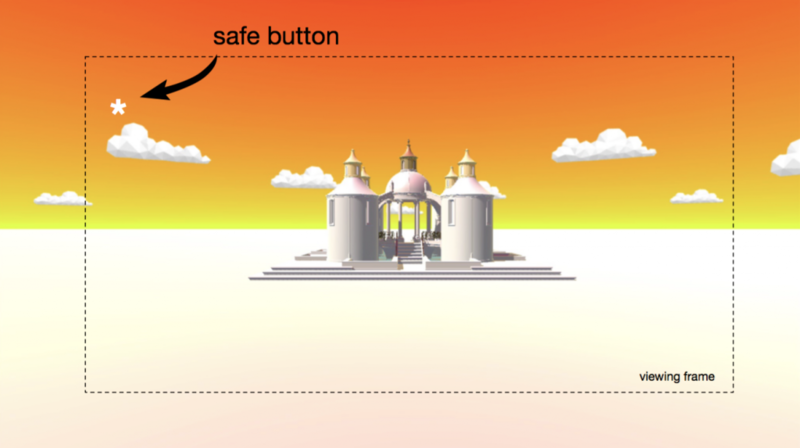 A HUD safe button would be desirable but, how to select it? In a 360º environment without fixed positions, obvious things like menu buttons are a new challenge in UX. less important, settings as change user, define speed, audio, etc. 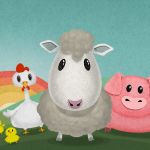 This visual element could display a menu or execute just one action, or even show a map. But more important than the action itself (as depends on the game or context) is where and how to display it. The optimal location would be a UI element (a button, cross, point…), a non integrated design on the scene, that stays fixed on the top, right or left, of the visual field. Even in a 360º world, and if the journey happens in an action while we are in the center of it, there should be always a frame that is the interface we have to deal with. The optimal location is at the top of the screen, not only due to basic usability standards (we use to look up to locate information, as signage, menus, flights, timetables, header on a letter, etc.) but also because it will offer information that is over the main action, it is a meta information. 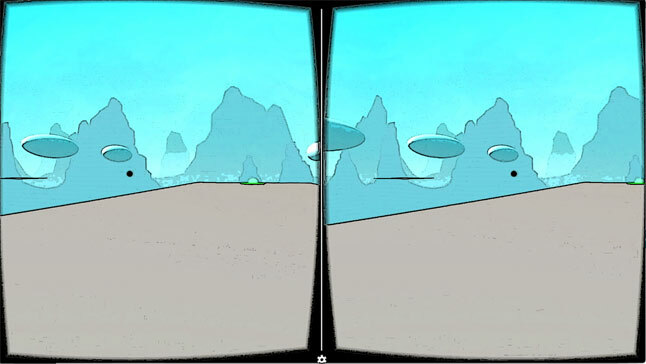 The problem here is that, by now, Google Cardboard technology does not allow to move the reticle on a certain point “out” of the 360 scene. We can not use a HUD as classic games use to do. The lack of eye tracking makes impossible to insert a menu or action button where we can fix the reticle, excepting the one in the center of the screen, that, obviously, should be reserved to keep the game action. 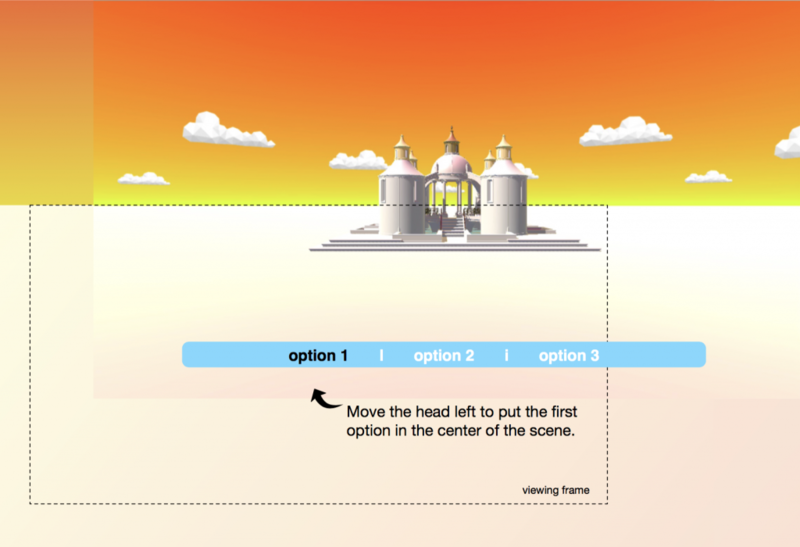 Once we know we cannot insert any meta-menu on the screen, then obviously we can insert an icon, or even a tab bar down on the footer of the scene (always visible if you head down or up), and, after a time, learning that if we keep it in the center of the screen, it will offer the actions of pause, stop or re-start. It means that we have to put the main action on a second place and take the time to move the head bottom up to set the icon or bar on the center of the screen. It is not so easy and simply as to focus on a permanent point on the top of the screen. Another solution would consist on inserting “control points” from time to time, as happens in video games when player ends the level. Again, not as user friendly as the permanent icon on top, and maybe appropriated only for games with several stages and not for continuum action, but it would work. An always-there menu on the bottom of the viewport would allow the user to easily get access to it and would not bother too much during the experience. 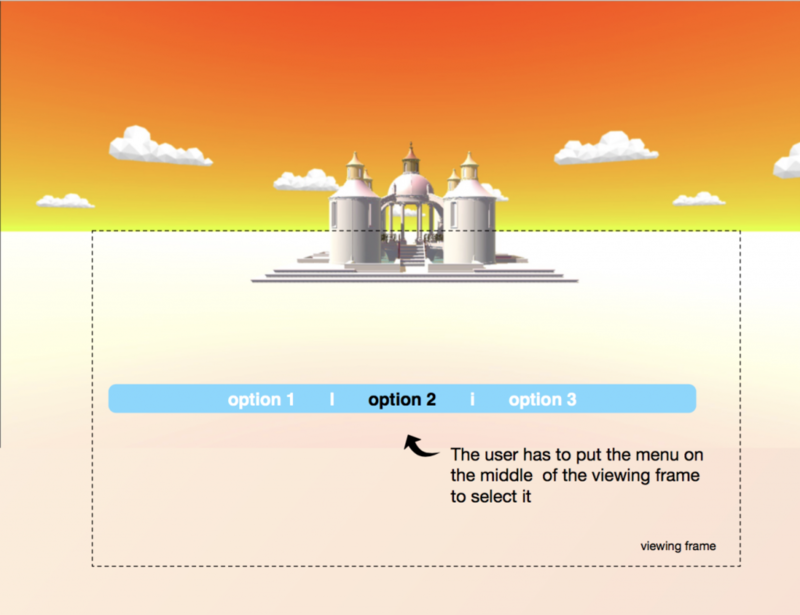 Once the glass reticle is “in touch” with the menu, it is stick to the scene, so the user can move over the menu and select the desired action. During this time, the scene is paused, but the head tracking remains. Moving the head the user would choose the desired option. Dealing with your hands while you are in an immersive experience provided only for your eyes (and maybe ears) means a step further. Wearing a VR device you can see nothing except the app inside the glasses, so it is a singular feeling if you have to manage a joystick or a button integrated in the glasses. For sure you can deal with it, but al least initially it could be an uncomfortable situation. Of course the joystick or the physical button that some glasses provide (variations on hardware promises to be the next nightmare for designers and developers) are an optimal place to set a menu or buttons for the basic commands such as stop, pause or restart. Changing an app is a terrible experience from a user POV. You have to take off the glasses, put off your mobile, close the app, open the new app manually, re-introduce the phone inside the glasses and wear them on again. Really? An app that allows to see the mobile interface would be and excellent idea (or some support on the device OS). Improve your elasticity. Practice Yoga! You will need it to fully enjoy a VR experience. Otherwise you won’t be able to look behind your back, stand in a chair with your legs down and jump 180º to look behind you or the opposite side. In real world, we turn ourselves to look behind, but in VR, we tend to rotate the head. An small inconvenient, indeed. Just think in the common roller coaster. And when we cannot access to the desired point, both if we are sitting down or standing (just DON’T), we tend to jump, without seeing anything we have around. Once more we face the convenience of a “safe button”. I like this name, “safe”, because it is not only for setting purposes, it has a psychological impact: to make the user to feel safe and to give him control. 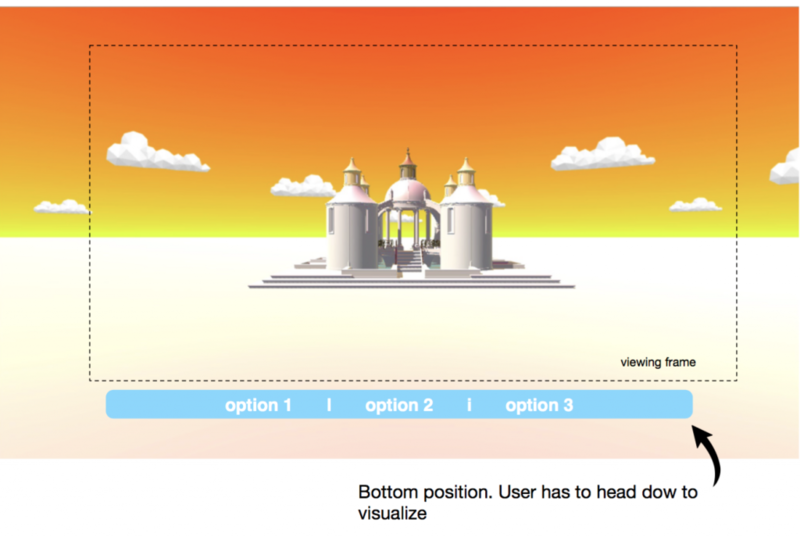 How can we design a 360º view without moving your head or body? Once more, all this solutions need eye tracking… or maybe lot of UX design and imagination. So meanwhile, Imagin&Tonic will use tones of last two (and common sense) to design solutions of the future!